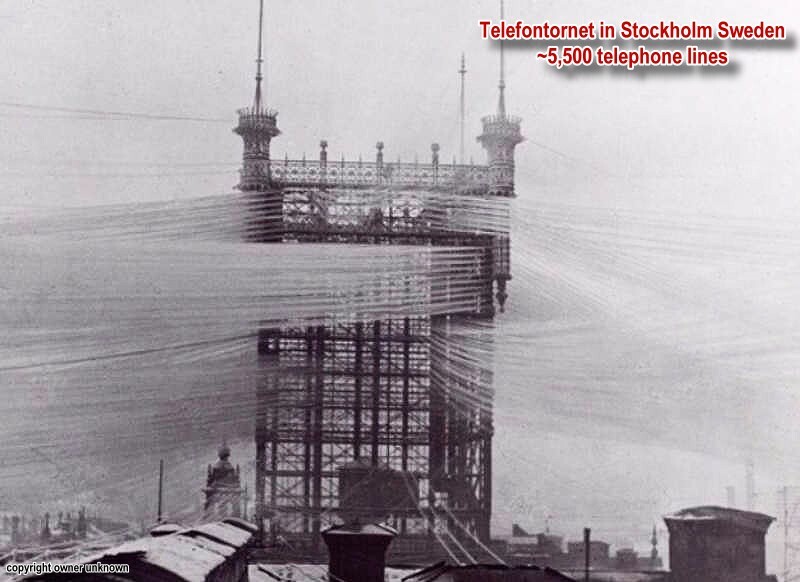 This late 19th century photo of a telephone cable tower in Stockholm, Sweden, is seen frequently on the Internet. The 'telefontonet' tower, owned by Stockholms Allmänna Telefon AB (which later merged with Ericsson), supported 5,500 lines. Those four decorative turrets at the top were added to beautify the tower after residents complained about it being an eyesore. Raise your hand if you think it was a good solution. A couple decades later, the company began burying phone lines underground and the tower was eventually taken down. At a smaller scale, many modern data centers look a lot like this inside with all the network cabling routed - sometimes neatly and sometimes not - between server cards and racks. I was going to post a photo of one of Google's data centers as an example, but of course all the publically available images show only the tidiest of installations with almost no cables exposed.